Complimentary Nights – Stay 7 nights for the price of 5 or 14 nights for the price of 10. Please contact us for further details. An intimate resort featuring 96 traditionally crafted yet ultra modern abodes, nestled amongst lush tropical gardens reminiscent of a Maldivian village. The Four Seasons is one of the world’s most premier luxury hotel brands, their Maldives resort is a prime example of the standard of exceptional quality, personalised service, superior design and finishes that brought the trademark its international recognition. Just a short speedboat or private seaplane ride over azure waters brings you to the resort offering escapism of your wildest dreams. Cosseted by a sparkling lagoon Four Seasons Maldives at Kuda Hura showcases a myriad of 5 star amenities, including fine dining restaurants with sublime ocean views, a huge freshwater infinity pool and a spa located on it’s own private island for extra peace and serenity. The resort’s marine discovery centre, with a 3D cinema, adds a unique opportunity to learn about the conservation of local marine life, including coral reefs, sharks, turtles and tropical fish. Complimentary Half Board – For applicable stays, enjoy complimentary half board for up to 2 people. Honeymoon Offer – Bride receives free speedboat transfers. Internationally acclaimed diving sights are on your doorstep at the Four Seasons. Explore these natural wonders with the resorts 5 star PADI dive centre for beginners and advanced levels. Learn how to surf the waves of waters averaging temperatures of 27 – 30 Celsius with the resort’s own surf school. Choose from kayaking, snorkelling, windsurfing, single sail, catamaran sailing, windsurfing, sailing, water-skiing, parasailing, banana-boating and fun tubes. Learn about the local marine inhabitants including turtles, coral reefs, sharks and dolphins at the interactive education hub. Gym – State-of-the-art equipment in an air-conditioned environment. Pools – Take the plunge in the fresh water infinity pool or paddle in the shallow wading pool that stretches into a free-form pool and extends to the very edge of the lagoon. Hop aboard a dhoni (native Maldivian wooden vessel) and be transported to a serene luxury spa on its own private island for extra peacefulness. Trained therapists use organic products and marine-based nutrients in their portfolio of indulgent relaxation, rejuvenation and beauty treatments. 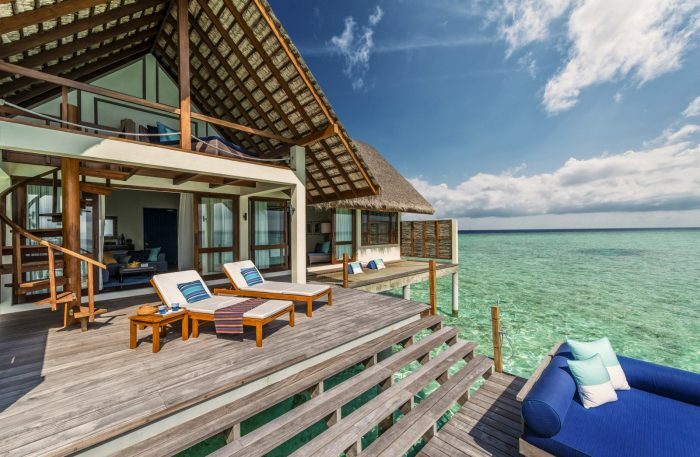 Choosing to stay at the highly reputable Four Seasons Maldives at Kuda Hura, offers guests ultimate piece of mind that they are in the most capable hands for a trip of a lifetime in one of the most exotic locations on earth. The Maldives is such a special place like few other, making it an ideal honeymoon destination. Staying with the Four Seasons offers luxury at the highest level with over 50 year’s experience in hosting the most discerning world-travellers. Newlyweds can make the most of the privacy and comfort afforded in the deluxe accommodations, featuring stylish plunge pools, outdoor showers and plush day beds perfect for close romantic moments. Experience a couple’s massage like never before, with private double treatment rooms in the spa complete with rectangular viewing windows located below each of the massage tables for an unusual view of underwater life whilst in the thralls of relaxation. Whether it’s a amorous walk on the beach just steps away from your bed, a gourmet picnic for two on a deserted island or a candle lit bath in your private pool, Four Seasons resort encompasses everything for instant seduction, long lasting pleasure and memories built to last. From curries made from scratch to authentic Italian fare, and international buffet breakfasts to homemade cocktails and fresh fruit shakes, the Four Seasons Maldives excels in providing some of the best tastes, textures and flavours in the archipelago. Café Huraa – Feast on Western, Asian and local Maldivian delicacies at Café Huraa’s two al fresco pavilions looking over the pool. Baraabaru – Tantalising Indian cuisine served in a colourful setting with atmospheric lighting, a 25 metre outdoor ‘over water’ deck, and an live cooking Tandoor Bar. Reef Club – An Italian fine dining restaurant serving classics such as pizza, pasta, salads and steaks. Kandu Grill – Enjoy fresh seafood caught daily by local fishermen grilled to perfection at this barbeque establishment. Sunset Lounge – Start the evening off at sunset with a fresh juice or cocktail at the open-sided pavilion overlooking the jetty. Poolside Terrace & Bar – In ultimate luxury style swim up to the bar for a refreshing drink and snacks whilst still submerged in the water at the poolside bar. In-Bungalow Service – Order room serviced available 24 hours a day from an extensive menu of food and beverages.